European countries are suffering from unsustainable economic models, too. Just ask someone who lives in Greece, Spain, or Ireland, or one of the EU members tasked with managing the European sovereign debt crisis. Europe’s cautionary examples have not deterred those dreaming up irresponsible policies here at home. Remember how our health care system got transferred to the government? Some European nations offer free college, so it shouldn’t surprise anyone that this is a popular idea with leftists who sound like they would prefer to live anywhere but here. Big labor has been actively seeking out college instructors, as discussed in this FORTUNE article.3 Pushing college as part of our nation’s free ride would be a big gain for unions. Increased enrollment would bring big opportunities to hire more faculty and staff and swell union ranks, especially at urban community colleges accommodating low income students. Free education of any kind is a free ride for unions. Their members get paid whether the money is there or not and they always have the option of refusing to provide services, as we just saw in Chicago. A ride on the free college train will help them get their hooks even deeper into our public school system as college becomes a government-sponsored extension of high school. 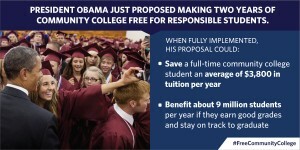 Chicago decided to add free college to its dream for America last year, extending the idea to four-year institutions.4 Obama calls no-pay higher education “America’s College Promise,” a good thing for his legacy, a bad deal for taxpayers, a terrible idea for broke Chicago, and likely not much of a bargain for students, either. It should be obvious to anyone who gives this any thought that employers will begin dividing job candidates into two groups: those who got a free ride and those who didn’t. The stigma of free college will never go away. Of course, those pushing this idea have no reason to care as long as the votes come in. Ask Bernie Sanders in the wake of yesterday’s victory celebration in Wisconsin. Opinions on what constitutes strength and fairness differ, with the line usually drawn between those demanding the free ride and those who have to pay. Politicians are in another group altogether. They just sit back and reap the benefits. Boasting 248 commutations, more than all six presidents before him combined, the president prides himself on his commitment to clemency7 and talks about what we can do for released criminals after they hit the streets.8 Most of the sentences Obama commuted were for cocaine, a punishment drug much less in vogue with politicians now that heroin and prescription narcotics have taken center stage. This is a good reminder of how much the political climate determines what is deemed good and bad for Washington’s dream for America. In crack cocaine’s case we went from an illegal drug ripe for criminalizing to a substance that calls for releasing offenders from prison, reinforcing the message that the law is about politics, not crime. New American Dream: what can we get for free next? Politics has shifted from individual responsibility to entitlement as Democrats endorse European-style responsibility for peoples’ lives for everything from health care to extended time off from work. Europe has become the measuring stick for policymakers as something to imitate, not avoid. Whether we are absolving students and homeowners of loan debt, giving away college for nothing, finding a way to give health care to illegal immigrants, or letting crack cocaine criminals out of jail, a Democrat’s dream for America will never mean a free ride for taxpayers. With Republicans in place to provide a measure of fiscal sanity it’s easy to forget what happens when their opposition in Congress loses control. The moment Obama took office a bill was proposed to establish the “United States National Health Care Act” to “…provide all individuals residing in the United States and U.S. territories with free health care that includes all medically necessary care, such as primary care and prevention, prescription drugs, emergency care, long-term care, mental health services, dental services, and vision care.”8 Astoundingly, this push for free national health care found 87 cosponsors9 while our country was struggling though a historic recession. Even the president’s party was wise enough to put the brakes on that. Democrats couldn’t bring wealth to the economy. Instead of admitting failure they created a new dream for America, the vision of government giving away Middle Class mainstays for free or compelling others to do it while politicians take the credit. This is the vision being pushed by our two Democratic contenders for president. They aren’t naïve enough to think that someone won’t have to pay. That’s not a problem as long as they can successfully saddle that someone with the bill. Updated April 7, 2016: text edits for readability and link to “Cancer is Important But Many Things Must Come First” added.